Samhain is here and at my house it is highly anticipated! I love walking into a grocery store and seeing all of the new Halloween decorations out for sale! Look at how so many people celebrate, albeit without knowing, our sacred turn of the year. Pumpkins, skeletons, black cats and scarecrows peek from houses and businesses. The fall harvest is in and the aromas of cinnamon brooms and pumpkin soup fill the house. Can you tell I love this time of the year? Let’s fill our hearths and hearts with the grounding abundance surrounding us. My heart and hands bring sacred peace to me and mine. I want to share my pumpkin soup recipe. Simple, delicious and perfect for this lovely month, this soup will nourish body and soul. It is a great recipe for keeping on hand in the pantry. I try to use fresh pumpkin but a 15-oz can of solid-pack pumpkin is just as delicious. If you use fresh, 1 ¾ cups of cooked pumpkin equals a 15-oz can. In a large saucepan sauté onion in butter until tender. Remove from heat; stir in flour until smooth. Gradually stir in broth, pumpkin, brown sugar, salt, butter and nutmeg. Bring to a boil; reduce heat and simmer for 5 min. Add cream and cook for 2 more min. until heated through. This is perfect with pumpernickel bread and baked apples. With all of the decorations available for sale I still prefer to fill my house with gifts from nature. I love leaves hot glued around pillar candles and wee baskets of acorns and crystals and pretty rocks. Pie pumpkins stacked on top of each other in baskets and bundles of herbs tied and hanging to dry in windows. Of course, we have a collection of black cats collected by each of my 3 kids over the years piled up on the hearth and adorable witchy-poos scattered throughout. This is our favorite holiday! Oh, and there is a tree branch decorated with orange lights and ornaments. The turn of the wheel has brought us to the end our sacred year. Within the delicious sights and smells of October, I send you blessings of peace and comfort as the veil thins and we remember the connection of all; here and beyond this life. Samhain just around the corner that makes September so happily anticipated in my house! I find my balance and restore my energy. The world is a constantly changing environment full of noise and all things artificial. We who look to nature for grounding and spiritual wisdom can have a hard time locating sacred space. I propose we consider the simple idea of using the power of intent and an organic apple to center ourselves. If you cut an apple in half around it’s circumference, it will reveal a star. When viewed as a whole you will discover a pentagram. With a single apple in your hand you hold the mystery of Gaia. Blessing the apple brings sacredness to the simple act of eating. I love the quiet in-breath of a blessing. Here is a morning prayer my daughter learned in Waldorf kindergarten. It feels perfect for fall! Let’s look at food for September. Cooking and preparing apples are not in my skill set mainly because I do not care for cooked fruit. My husband does not understand seeing how he comes from the “fruit belt” of this country and his mother was a great cook! But apples are the perfect food for September and I do slice them and dry them by stringing them. They are then ready for trail mix or breakfast cereal or just simply snacking on. Plus they look so pretty hanging in the windows along with my herbs. There will be plenty of time spent dehydrating herbs and preparing medicinal salves, honey and supplements. Like the squirrels, fall is the time to take stock and prepare. There will be a lot of work to do in order to prepare for winter, but for now, enjoy the perfectly balanced energy of September! Book of Seasons for July! Strawberries and Sailboats! Summer is at its height in the northern hemisphere. Here in the “deep south” everything slows down to a crawl. It is hot. And it is humid. And it is time to just be in the moment. Gardens are lush and the sounds of nature are constant. How I love listening to the birds as the sun rises and then the chattering of cicadas and tree frogs as they join the song. I try to keep the windows open as long as possible in order to hear the hawk and the blue jay just a smidge longer. I bask in the sunlight and join the song of Gaia! Sailboats and summer go hand in hand. I adore wee little sailboats floating down the river lazily bobbing in the current. I envision dear fairies eating wild strawberries and chatting with dragonflies as they drift on the water. With walnut shells, a toothpick and some paper, a tiny sailboat can be fashioned. First, carefully crack the walnut and remove the meat. Voila! A boat! Cut a sail from paper and wrap around a toothpick. Tack it together with glue stick or staple. Next anchor the toothpick in the walnut shell. I drip wax from a birthday candle to hold it in place. Now float on water! No river or creek? Then a bowl of water on the table is perfect. How about a regatta of boats with different colored sails among floating candles? Lovely outside at night as the fireflies are waking. What a perfect setting for strawberries to be eaten! My favorite way of serving strawberries is to cut them and heap them on pound cake. Top with whipped cream. Simple but tasty! Frozen, they are fun to drop into wine, champagne or ginger ale. As we bask in the sun and drink in the beauty of the night let us feel the connection to Gaia and each other. Each of us is a blessing to each other as well as to Earth herself. Our next month in the Book of Seasons is March and the beginning of the turn of the wheel to Spring! With the arrival of the equinox comes the perfect time to check in with our heart and breathe into the balance of the Earth. The deep quiet of winter is at an end. Before the quickening of life begins, take time to enjoy the momentary lull. Soon the stirrings of new life will begin and our focus will be drawn outward. My inner world is in perfect balance with my outer world. As a way to engage heart and hands in the season I offer the making of a table top Medicine Wheel. The Medicine Wheel that I created starts with a ten-inch flowerpot saucer. Any round and shallow dish will do. I gathered sand from the banks of the river outside my home to fill the dish. With stones the circle is divided into quarters. Each one devoted to an element. With symbols for each element I decorate the area. In the corner for North sits a crystal and piece of cedar. East has a feather and brass bell. South has two small candles and West has shells. 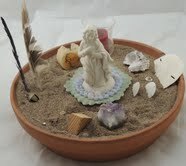 In the center of my Medicine Wheel is an antique dish with a porcelain statue of Mother Mary. My prayer beads swirl around her feet. I have it sitting by the door to the family room and can see it frequently. The balance of the four elements is a reminder to center my energy. Another artistic idea would be to braid three long pieces of yarn, floss, string, or whatever calls you. You will have a thread for the past the present and the future. After braiding, space two knots across it. Now tie onto wrist and cut any excess. Each knot can represent the two equinox days. Those days in our personal timeline of past, present and future that we remember our balance point is a time to reflect on where we are at this moment in our journey. Similar to prayer beads, this bracelet can act as a touchstone in our day. In a particularly hectic moment the simple act of touching the braid can draw our energy back inside us and bring focus. March is also a wonderful time to bring new green food back in to our diet. Fresh sprouts as well as green tea brings the vital energy of spring into our systems. Think about foraging for wild edibles in your yard. There are many sources on the internet to guide you in choosing delicious additions. Dandelions are the most abundant weeds in our yard and the leaves make a lovely flavor offering to eggs and salad. And the yellow flowers add such fun to any dish! Don’t forget St. Patrick’s Day and all things green, green, green! The second month in my Book of Seasons begins with Bridget’s Day. I offer the following as ideas for exploring the month in your book. Just as a Book of Shadows is a personal expression of it’s creator, so too, is your Book of Seasons. What makes February special for you and yours? Gather together ideas from books, magazines and websites and copy or print out. 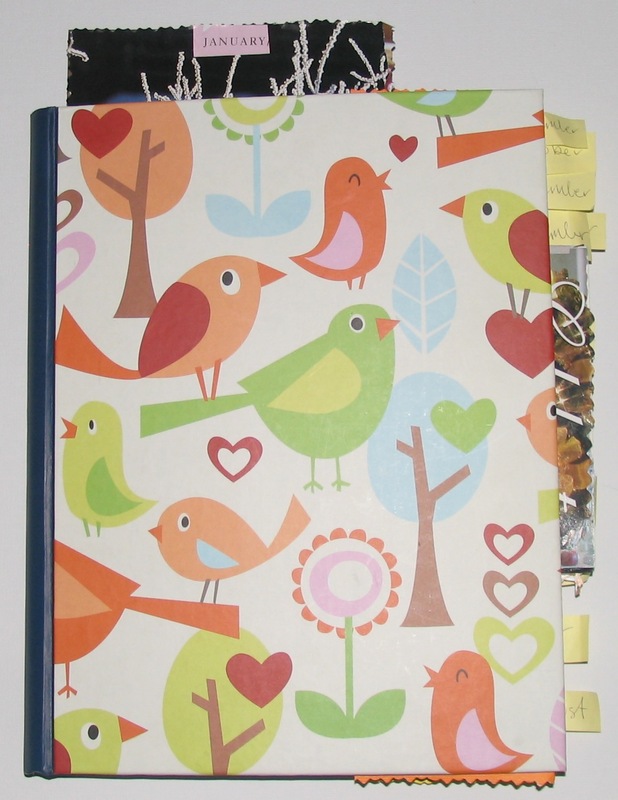 I have file folders and three-ring binders to keep recipes and art ideas as well as inspirational articles and quotes. Anything I do special for the month is recorded into my Book of Seasons and dated. 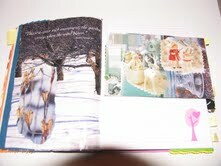 I am rubbish at taking pictures but when I do, I place them in the book as well. Usually a sketch to remind me of altar set up and artistic project is all I need. The flame of Bridget radiates from within me to illuminate this place where I AM. Each morning in a small journal I write my affirmation of the day. This is to help me stay on track and focused on my intent for the next 24 hours. The affirmation for the month is to remind me of the bigger picture. It is to center me for moving into my greater good and therefore bringing the essence of Goddess to my world. Create an affirmation for your month or use mine. Let it bring us closer in alignment to our path. Let’s take our monthly affirmation and express it outwardly in an artistic way. Since the flame of Bridget is a comforting symbol for me, I am crafting a table garden of light. I put a layer of pebbles on the bottom of a 13×9 inch glass brownie pan. Then I fill with potting soil and top with live moss. Often I will open a space in the moss and place a small dish to hold water and tiny walkways of flat pebbles around it. It looks like a small lake and path! I then nestle birthday size candles in holders among the moss. At sunset on the first of February, I light the candles and welcome Bridget into our home. With misting, the table garden will last for years! Food is an important part of every season and February is month we can celebrate Bridget with dairy based food! And cheese fondue is the perfect blend of fire and dairy! How do you bring the sacred into the season? I invite you to journey with me as we create a Book of Seasons. This book will be a personal journal that will be a companion on our sacred walk through this new year. As individual as each of us, no two books will be alike. It can be a diary, art journal, spell book, daily gratitude list, or something unique that speaks to your heart. My own Book of Seasons combines all of the above. Each month I will suggest a focus, affirmation, artistic activity and a food to explore. This is one way of fully experiencing the “now” and bringing into our intentions the good we seek. To begin with I suggest purchasing a blank journal. I found one at the local drug store, but I have used composition books and spiral notebooks in the past. 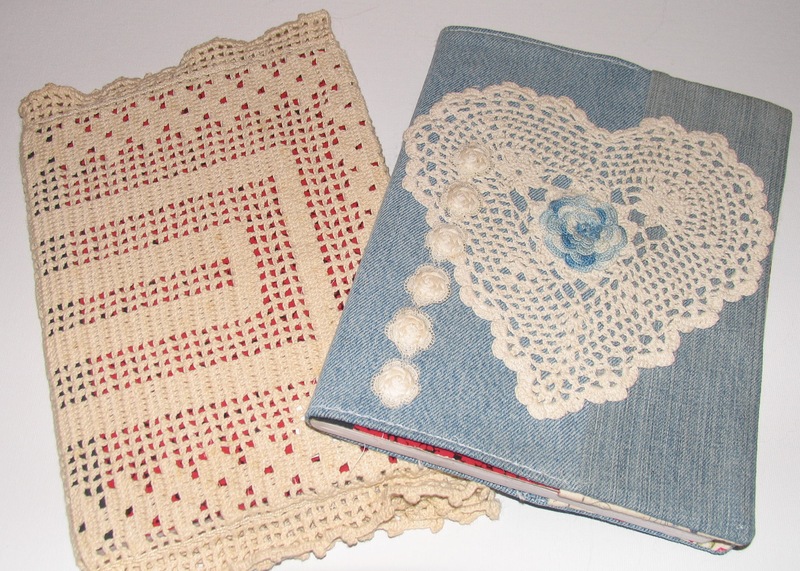 A cover either sewn or decoupaged adds an inviting touch. If using a large journal, separate the pages into 12 equal sections. I began by separating mine into four seasons. I collaged the first page of these sections to indicate the season. Then I used sticky note tabs for each month. My intention this year is to make a bookmark for each month as I go along. 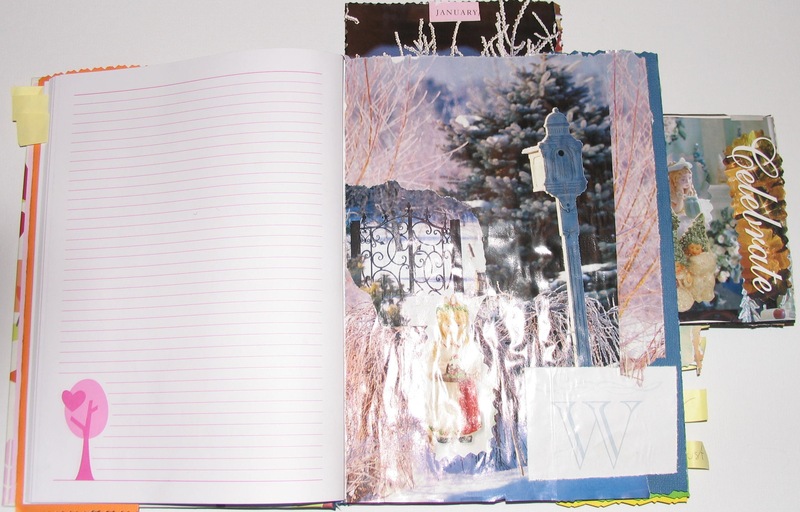 If using a composition notebook, they are perfect for individual seasons. Just four books and you are set! 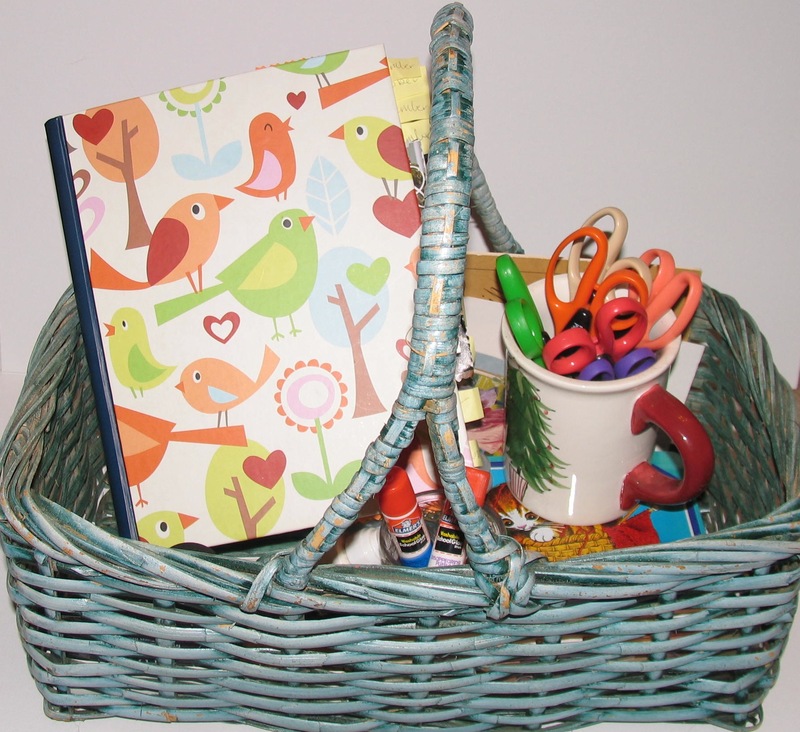 I keep my Book of Seasons in a basket with my favorite pen, a gluestick, magazines, catalogs and beautiful cards I receive. I follow my heart and write a daily affirmation for myself. I list all that I wish to place into a vision of a pink bubble as a tool of intention. Doodles or mini collages grace most pages. My first entry for January begins with an affirmation. I breathe deep the peaceful quiet of winter’s dark night. My thoughts for the day follow and then I completed the entry with a hot chocolate visualization. I hope you will take the opportunity to follow along with me as we bring into being a Book of Seasons. I would love to hear of your creative epiphanies and ideas for each month!